Edia is a land in the sky, a collection of floating Islands centred over a portal stone. The Sky Islands, or Upper Edia as the humans refer to it, is where the Asentari make their home. 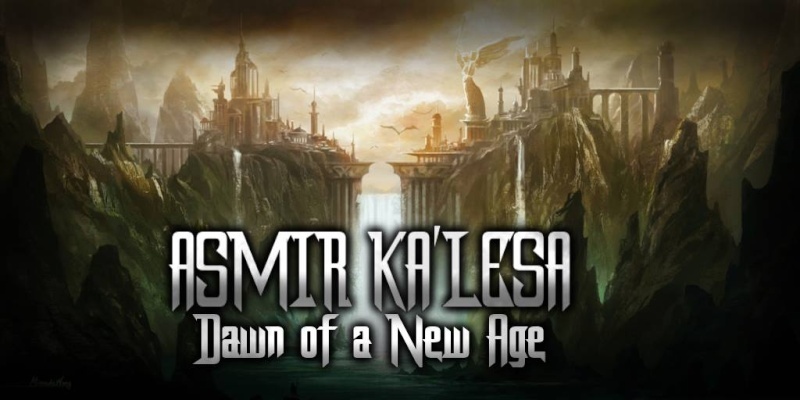 This land is significant as it is their birthplace as a race, where their forfathers, the dragons, used to live before they left Asmir Ka'lesa. The Asentari are very territorial over these Islands, and trespassers are not treated kindly. Eapara is the capital city of Edia as a whole. Humans who are resident to lower Edia are permitted within its walls, with rope bridges well maintained to allow travel between the various islands the city makes up. Outside of Eapara, there are a multitude of small villages, and one or two towns, though certainly not nearly as many as there would be in human or elven territories. Though the bridges even in the outlying areas of Upper Edia are well maintained for safe travelling. Below the sky islands sits the land known as Lower Edia. When the Asentari revealed themselves, they claimed all the lands below their Islands, and permit only the resident humans to stay. They treat other races with distrust. They are ferociously territorial, and the humans who live in the shadow of upper Edia are greatful for the protection, even if they long to live above. Though there are a select few who do live above. Humans are also involved in their government. They live in their lands, they should have a vote and a representative or two as well. At the very center of lower Edia sits a portal stone that warps the users to a corrisponding stone above it in the city of Eapara. This stone was created by the dragons so that humans could enter certain areas of upper Edia, though now it is heavily protected by the Asentari, who have built a fortress around it to stop unwanted use of the stone.